However, their journey to becoming doctors was anything but easy. "We were on welfare for a while, coming back in the U.S and starting back up," Gloria shared. "My mom was a janitor at her first job when she started back over, and they both went back and got their college degrees and their master's degrees." In an Instagram post, Victor thanked Martin for sharing he and his siblings' story, and shared more details, writing: "Despite my older sister being top of her class and having one of the highest entrance exams in her class, the private school in which my parents had applied for back in our home country of Nigeria unfortunately wanted bribes and additional things. Disheartened, my parents left all they knew and relocated us to Texas with old family friends of ours in hopes we wouldn’t be limited by those barriers they themselves encountered. My father and mother left their professional careers of being a pilot of over 19 years and a bank manager, respectively, only to begin afresh in the U.S. re-enrolling in college as freshmen and working odd jobs ultimately getting their SECOND bachelors and master's degrees all to sustain us all because they had higher aspirations for us. Though things are now better in Nigeria, this is more a testament of their will and sacrifice than it is about our achievements here." 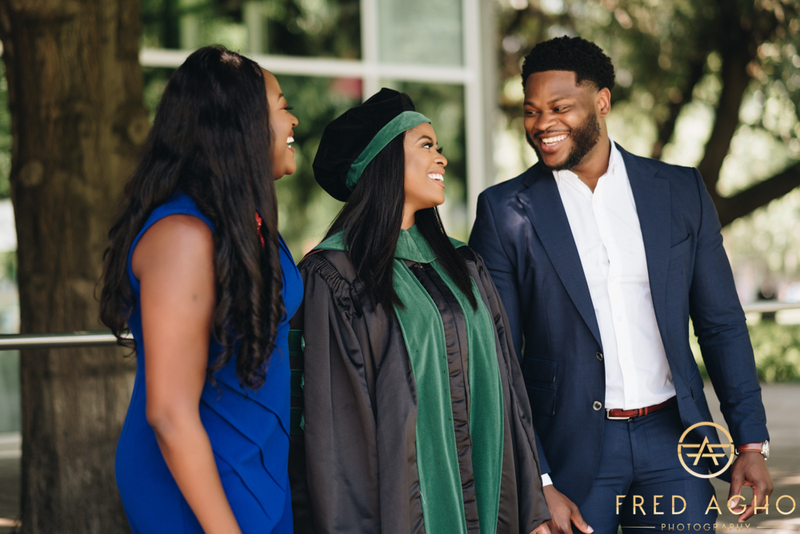 Victor received his doctorate of pharmacy from Texas Southern University, Gloria graduated from John P. and Kathrine G. McGovern Medical School at The University of Texas Health Science Center at Houston, and Blessing, the family's most recent graduate, also graduated from McGovern Medical School. She's now doing her residency in Austin. Victor concluded his Instagram post by saying: "We hope we’ve made them proud and hope we can inspire others to do the same here and afar, not just in medicine but in sports, business, entertainment and wherever excellence might lie." We're sure your parents are more than proud. Congratulations to all three Dr. Oyeniyi's.